3COM is the manufacturer of the PALM-Pilot. PalmOS-HOWTO (former Pilot-HOWTO) by David H. Silber. PilotLink and XCoPilot PilotLink is an utility that performs data transfers from 3com PalmPilot handheld computers to your Linux machine. XCoPilot is an emulator of the PalmPilot operating system that runs under Linux. PalmVNC is an implementation of the Virtual Network Client architecture that will allow you to use a Linux or other UNIX machine to put up a (tiny) X Window on a 3COM PalmPilot. Figure 7-3. 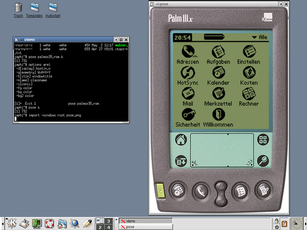 Screenshot of the PALM-Pilot emulator POSE.